Buy the Farm . . . Share: Feast of the Several Fishes. Well, Four Fishes. Kind of. Feast of the Several Fishes. Well, Four Fishes. Kind of. On Christmas Eve Eve Eve we had a guest for dinner. 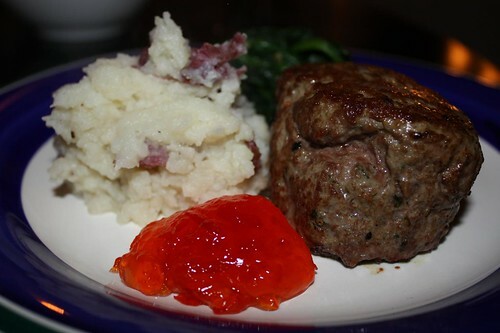 It was another night where I had about 15 minutes to prepare dinner, therefore I quickly made this lamb burger, mashed potatoes, garlic spinach, and red pepper jelly. It was the perfect accompaniment to some Brooklyn Brewery Winter Lager and A Colbert Christmas: The Greatest Gift of All. Christmas Eve Eve saw Jen creating her traditional Christmas Eve dish: clam corn casserole. 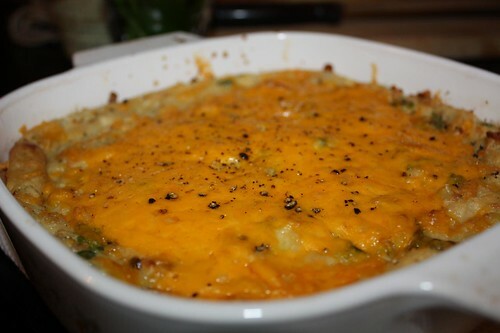 Clam corn casserole tends to get a mixed reaction from people when they hear about it. They either think it sounds fantastic or they think it sounds like the most vile thing they've ever heard of. I tend to find it falls much closer to the former. After all, how can combining clams, saltine crackers, and cheddar cheese be all bad? 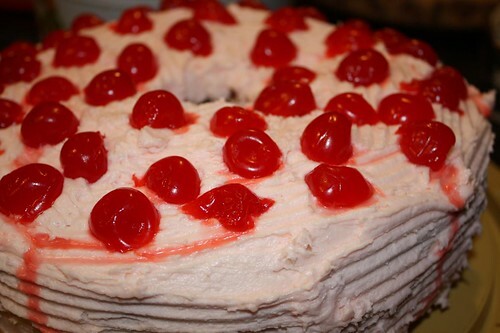 For Christmas day my mom made this amazing maraschino cherry cake which she got from Betty Crocker's New Picture Cook Book (published in 1961). Apparently she used to make it all the time before I was born. Then I came along and apparently ruined everything. Now that she's had sufficient time to recover from my intrusion she's taken to making it again. It was worth the wait. On boxing day we came home with a strong urge to take a night off of butter, cheese, and rich pastries. I steamed some shrimp, sauteed some garlic, shallots, and shrimp with a little white wine and tossed it together with some mafaldine. I omitted the Parmiggiano that I normally would have added in the interest of decholesterolifying our weary veins. I've taken to a recent fascination with The Feast of the Seven Fishes. 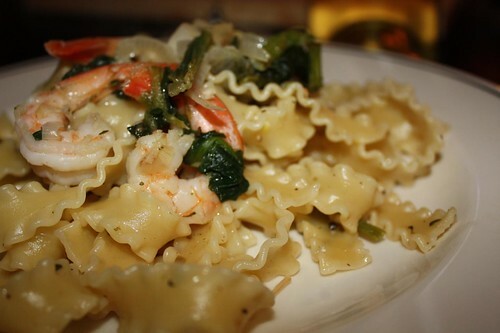 This tradition is unique to Italian-Americans, a fact that I learned on Christmas Day after finding that my cousin had prepared the meal for some Italian-Italians who had no idea why she was making such an seafood-centric feast. The tradition tends to bend the definition of what a fish is to include any number of mollusks, crustaceans, or sea-dwelling critters. Since their definition of fish is so loose I took to stretching my definition of Christmas Eve to include the months of December and January. This would give me more time to prepare all of these fishes! Who has time to prepare all seven in one night? 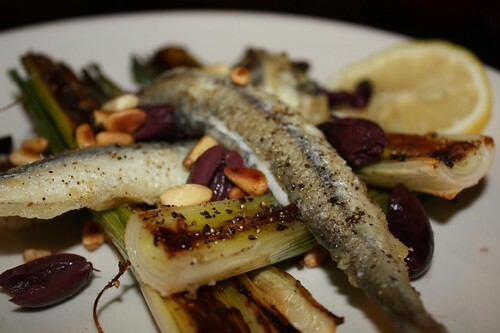 I fried up some smelts and served them with leeks that I roasted in the oven, sliced kalamata olives, toasted pine nuts, and a little lemon. Jen was a little leery of having the smelts after hearing my mother recount a traumatic childhood experience where she'd eaten a smelt that was filled with fish eggs! Luckily that experience was not reprised this evening. 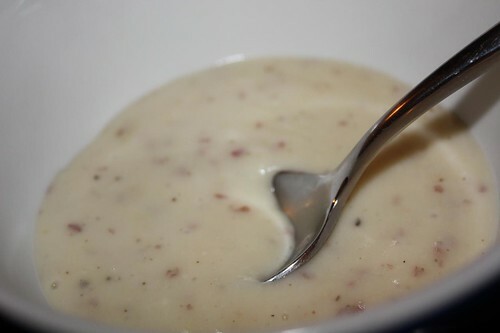 Using some leftover mashed potatoes from the lamb burgers we had on Tuesday night I made some soup with celeriac, garlic, shallots, turkey stock, and a little skim milk. We each had about a ladle full of the low fat soup which turned out better than I'd even hoped. 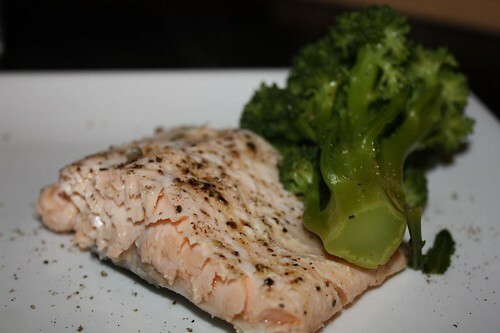 I also steamed some char and some broccoli with white wine and lemon. As you will note the broccoli was a little overdone but its lack of fat was a welcome addition to our cheesified bodies. We kind of fell apart at the end with this amalgamation of leftover desserts from my parents, family, and that had been lying around the apartment when we returned home. 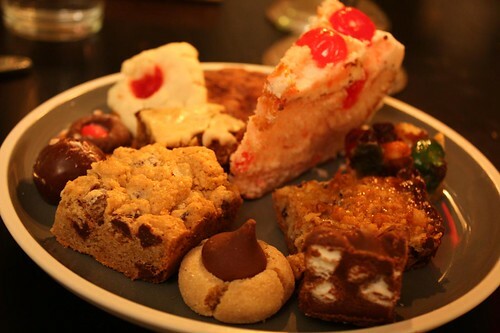 We started out really strong but it's just hard to turn down a plate filled with delicious butter-filled treats. I'll start the diet tomorrow! Aye aye aye!